Why is ICE-ing even a thing? Facepalm: A strange trend has started appearing across the US in which pickup truck drivers are using their vehicles to block access to Tesla Superchargers. It’s known as ‘ICEing,’ which comes from the words "internal combustion engine." But one Model X owner has shown there’s a way to fight back: tow the trucks out of the way. 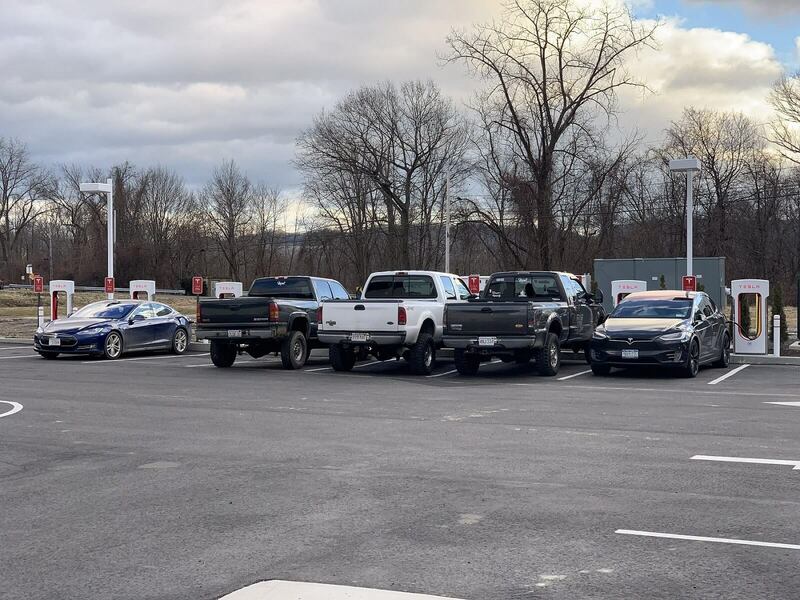 The ICE-ing phenomenon was first highlighted a couple of weeks ago in Hickory, North Carolina when 3 large pickup trucks blocked a Supercharger station next to a Sheetz, all while the owners chanted “f*ck Tesla.” It was only when confronted by a Sheetz employee that they left. Several Reddit users have posted examples of ICE-ing taking place in other states, though it’s not clear if all of these are protests against Tesla or if some are just people not realizing, or caring, that they've parked in front of the stations. In some states, it’s illegal for gas-powered vehicles to block EV chargers, and more locations are working on introducing similar laws. While antagonizing several angry pickup drivers even further probably isn’t a good idea, YouTube channel Tesla Trip showed that EV owners could tow one of the offending vehicles away from the chargers. Patrick Lawson proved that his Model X could tow his sister's 5,000-pound Chevrolet Silverado 1500 pickup. The truck didn’t have its manual parking brake applied, though the transmission was in park. "I just keep seeing videos of people ICE-ing, and figured this would be a good de-ICE-ing video," said Lawson. "All of us Tesla owners are super nice guys, and we don't want any confrontation with these jerks that are blocking Superchargers." "If you need to, show them this video. If anything, they're just a minor inconvenience," he continued. Although there's no guarantee that doing so won't lead to a punch in the face. ICE-ing has been compared to ‘rolling coal,’ an anti-environmentalist practice whereby truck owners rig their diesel engines to consume more fuel so they emit clouds of black smoke.